Two of the two features of Microsoft Windows Vista that I believe will be a major improvement for the average user are Windows Mail and Microsoft Calendar. Windows Mail feels much more like Outlook Lite than Outlook Express did, with many of the features the full version of Outlook included in this free program. Of particular interest for the average home user is the improved junk email filters, antiphishing protection and instant search features from within the operating system itself. 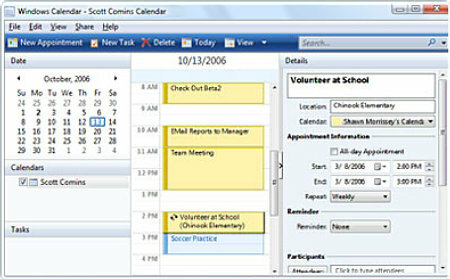 Windows Calendar, also included in Vista, makes a great tool for planning your time and reminding you of important events. The software includes the ability to share your calendar with others and even publish your schedule to any iCalendar ready application or online service. While most professional and power users will continue to use Microsoft Office’s Outlook program, for the average home user this is a nice set of features included free with Vista.